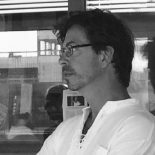 “Koorizon” is one of the blogs by choir conductor, composer/arranger, writer and web developer Taco Sorgdrager. The name of this blog is a Dutch wordplay with the words for “choir” (koor) and horizon (the same in Dutch). I write here about my experiences as a choir conductor and my thoughts about music. As a conductor, I can look back at some 30 years of experience in leading choirs. Currently I am conductor of the Morgana Chamber Choir in The Hague, the Netherlands. This blog was previously named “Inchoirius”, due to there being posts in both English and Dutch. However, I found out that it is impossible in to set the language per blogpost in WordPress. Because a wrongly set language can negatively influence the search results of blogposts in search engines, I decided to split the languages in two separate blogs. All the Dutch blogpost can be found here, and the English ones have moved to www.inchoirius.wordpress.com. In case you were looking for a specific blogpost in English you read before, you know where to find them now.